Provides a perfect cleaning of the bottom and the walls of the pool. Made of gray shark polypropylene with a robust finish. 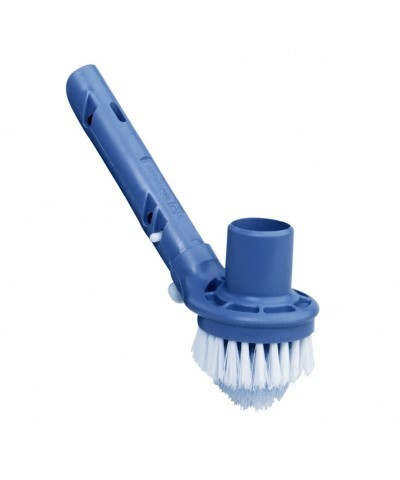 The bristles are made of white and blue polypropylene. 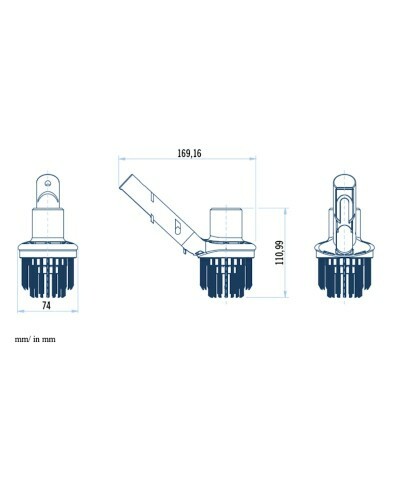 SHARK SERIES Model:: 36617 Angle suction brush specially designed for the corners of the pool, this brush is equipped with a practical connection to a suction pipe.. Product gender: Brushes for swimming pools..
€13.64 Vat incl. €13.64 Vat excl. Characterized by exclusive and cutting-edge design, the SHARK range of accessories is distinguished by their strength and effectiveness in the execution of basic pool maintenance. The various parts of the body of the blue shark (fins, jaws and gills) have been the source of inspiration in the design of these products, in harmony with the aquatic environment of a pool. The SHARK SERIES includes leaf collectors, chlorine dispenser, manual pool vacuum cleaner, thermometers and two important innovations: a special brush to clean the pool walls and a suction brush for the pool corners, to ensure that the pool is always in optimal conditions. Everything you need to keep your pool perfectly clean in a practical and fun way. Choose SHARK SERIES and start to see the pool cleaning brush and leaf collectors as two other decorative elements in your garden. With our range of SHARK SERIES, functionality and efficiency are beyond the height of the product image. The avant-garde design and the gray shark finish gives the whole range an elegance that distinguishes them. The SHARK series products are made of resistant thermoplastic materials, which are also resistant to UV rays. Do the cleaning and SHARK SERIES will help you make your pool maintenance fun, thanks to their lightness and design simple to handle. 36617 Angle suction brush specially designed for the corners of the pool, this brush is equipped with a practical connection to a suction pipe. Price €13.93 €13.93 Vat incl. €13.93 Vat excl. SHARK SERIES Model:: 36616 Wall brush with the angle between the bristles and the handle reduced to form a brush that adapts to the pool wall, allowing effortless cleaning..
Price €15.03 €15.03 Vat incl. €15.03 Vat excl. SHARK SERIES Model:: 36615 Brush for pool bottom ideal for cleaning the pool bottom, thanks to its size and its special design..